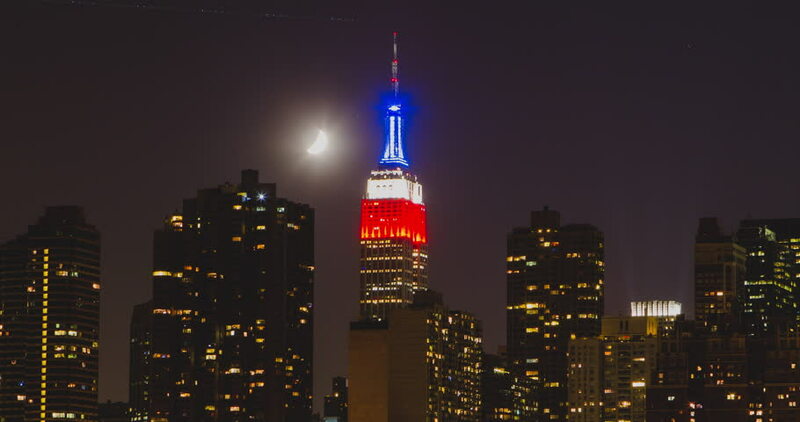 New York City- June 2013- Timelapse - Medium shot of the bright moon setting behind the lit up Empire State Building in red, white and blue. hd00:06New York City- August 2013- Time lapse of Empire State building lit up in red, white, and blue. Light city lights flicker as cars wise by in this vibrant video. 4k00:15A shot of New York City's Empire State Building in an industrial setting. Shot during the autumn of 2016 in 4k. 4k00:13NEW YORK CITY - CIRCA 2015 - Midtown Manhattan in New York featuring the Empire State Building.